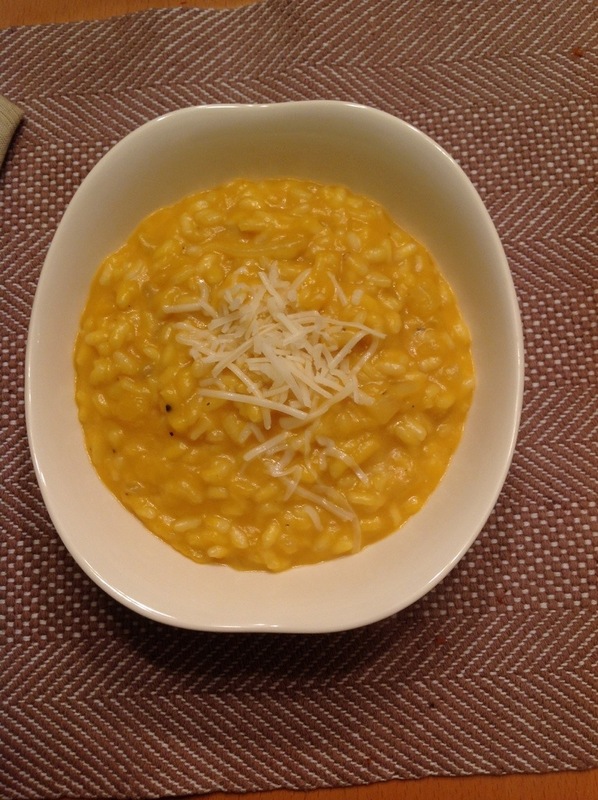 On a chilly night, this butternut squash risotto is pure comfort food! Winter squash is a great budget saver and so absolutely satisfying to eat on a chilly day that I have a hard time getting my fill. Like sweet potatoes, winter squash can be used in either sweet or savory dishes, which makes them incredibly versatile. I never used to make squash much because the peeling/chopping/steaming just seemed to take too long, especially on a workday. Now I never bother with all those steps. Instead I just cut the squash in half and roast it cut side down on a foil lined baking sheet for about an hour, scoop out the roasted pulp and freeze it for later. The skins can be composted–nothing goes to waste! Butternut squash all ready for the oven! This is how they look after roasting for about 40 minutes! A couple of weeks ago, I received some butternut squash with my Produce Box. As nice as it was to see squash again, it was about 90 degrees outside and I just wasn’t ready. So, while I was roasting some tomatoes for sauce, I popped the squash in the oven as well and then froze the cooked pulp for later. I received more in my box yesterday and decided to roast it while I took my evening run. It was all kinds of yummy goodness by the time I came home! Just perfect for butternut squash risotto–a great supper (or side dish) on a chilly evening. To roast the squash, cut the squash in half remove seeds and sprinkle the cut sides with olive oil. Bake (cut sides down) on a foil lined baking sheet for about 45 minutes at 400 degrees. Roast until soft. Cool squash and scoop out the pulp. Use the pulp immediately or refrigerate for up to 2 days or freeze for up to 6 months. In a small saucepan, heat the chicken stock and keep warm. Warm stock will incorporate into the rice much more quickly and you won’t have to reheat the rice each time you add stock. Stir in the rice and continue cooking and stirring until the rice is glossy and starting to become translucent, about 3 minutes more. Pour in the wine and stir. Cook until wine has cooked down and is absorbed by the rice. Stir in one cup of the hot stock and one cup of the squash. Cook and sir until the stock has been absorbed–about 5 minutes. Continue adding the stock, one cup at a time, letting the stock fully absorb into the rice before adding more. With the final cup of stock, add the remaining squash. Cook until stock is absorbed. This will take about 35-40 minutes. Add the Parmesan, salt and pepper (to taste). Turn off heat and let risotto sit covered for about 5 minutes. Stir and serve!